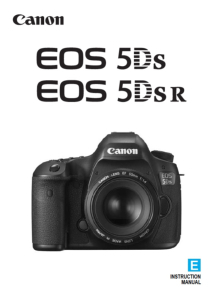 A black-and-white reprint of the original instruction book supplied for your Canon EOS 5DS camera. Professionally produced as a high quality, spiral bound A5 book. A black-and-white reprint of the original instruction book supplied with your Canon EOS 5DS camera (sometimes only supplied online as a downloadable PDF guide). Finished book size is A5 (148 x 210mm). A very useful aid for getting to grips with this versatile and highly featured Canon Camera. Although a disc comes with the camera in my view there is no substitute for a hard copy manual. Nicely put together in 2 volumes and in a nice size font I was very pleased with it. Manual is faithful to the pdf version and printed clearly on A5. Comes as two booklets one of 254 pages and one of 279. A great reference for a complex DSLR. Thank you!